The first St Pierre and Miquelon stamps, issued for the purpose of raising money for charitable purposes, appeared in 1915. These are regular definitive and commemorative postage stamps, but they have a "value added tax" or "surtax" on them, designed to raise additional money for national organizations, public events, and public charities. It seems appropriate that the first St Pierre and Miquelon stamps for charitable purposes were issued during World War I. One would think that these islands, nestled between Canada and the United States, would be immune to any European war, however, the wartime draft in France during World War I also applied to male citizens of St. Pierre and Miquelon. About 400 male residents of this tiny colony fought in the French military during the war, with an estimated 25% of them having been killed in action. The two St Pierre and Miquelon surtaxed definitive stamps shown above were issued in 1915 and 1917. The 5 C. surtax on the sale of the stamps was donated to the Red Cross. 10 C. + 05 C. (1915 - Sc. #B1) - Carmine Rose & Red. 15 C. + 05 C. (1917 - Sc. #B2) - Dull Violet & Rose. The surtaxed St Pierre and Miquelon stamp shown above was issued on October 24, 1938 to commemorate the 40th Anniversary of the Discovery of Radium. The design features Pierre Curie (1859-1906) and Marie Curie (1867-1934). The 50 C. surtax was for the benefit of the International Union for the Control of Cancer. 1.75 F. + 50 C. (1938 - Sc. #B3) - Bright Ultramarine. 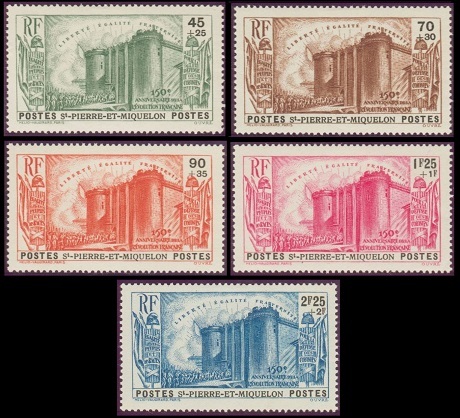 The five surtaxed French colonial stamps shown above were issued on July 5, 1939 to celebrate the 150th Anniversary of the French Revolution. The common design depicts the Storming of the Bastille. The surtax was for the Defense of the French Colonies. 45 C. + 25 C. (1939 - Sc. #B4) - Green. 70 C. + 30 C. (1939 - Sc. #B5) - Brown. 90 C. + 35 C. (1939 - Sc. #B6) - Red Orange. 01.25 F. + 01 F. (1939 - Sc. #B7) - Rose Pink. 02.25 F. + 02 F. (1939 - Sc. #B8) - Blue.